Anoriginal Mercury astronaut and a spacecraft set to orbit the planet Mercurywill be featured on two United States postage stamps to be released next year,according to the U.S. Postal Service. AlanShepard, who became the first American in space 50 years ago next May, will behonored together with NASA's MErcury Surface, Space ENvironment, GEochemistryand Ranging, or MESSENGER, probe, which is scheduled to begin orbiting theplanet closest to the sun in March 2011. Thetwo stamps, which will be offered as an attached pair referred to as a"se-tenant," are tentatively scheduled for release next spring. ThePostal Service announced the two space stamps, as well as 67 other stampsplanned for 2011, at the American Philatelic Society Stamp Show held last weekin Virginia, according to the stamp collecting newspaper Linn's Stamp News andthe website, VirtualStampClub.com. AlanB. Shepard, Jr., who in addition to flying onboard the May 1961Mercury-Redstone 3 suborbital mission was the fifth man to walk on the moon(and the first to hit golf balls off it), will be the firstAmerican astronaut to be honored on a U.S. stamp. Sincethe early 1970s, U.S. stamp selection criteria have required an individual bedeceased at least five years prior to their being eligible for consideration.Further, events of "historical significance" are limited forcommemoration on anniversaries in multiples of 50 years. Sheparddied of leukemia at age 74 in July 1998. 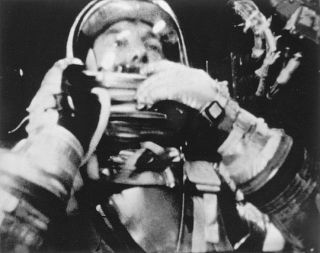 Although he was not the firstastronaut to pass away, his first flight is the first U.S. manned mission toreach 50 years. PreviousU.S. stamps have depicted scenes from NASA's manned missions including a 1967issue showing the first American spacewalk and a 1969 commemorative honoringthe "First Man on the Moon," but neither explicitly named theirdepicted subjects as Ed White or Neil Armstrong. In addition, to date allastronauts appearing on stamps have been illustrated wearing their spacesuits,their face hidden by their helmets' visors. Astamp issued in 2000 came close to honoring another of Shepard's peers.Released as a part of the "Celebrate the Century" series as a resultof the public voting to include Mercury astronaut John Glenn's 1998 spaceshuttle flight as one of the highlights of the 1990s, it avoided breaking therules by depicting the Senator's spacecraft rather than the man himself withonly the words, "Return To Space." Asimilar approach was employed for the 4-cent "Project Mercury" stampthat was produced in secret and released to celebrate Glenn's first return fromspace. Released on Feb. 20, 1962 within minutes of Glenn's splashdown, thestamp's illustration was of a Mercury capsule in orbit. Thefirst such stamp was released in April 1975, depicting NASA's Mariner 10 spacecraft.Departing Earth two years earlier as the seventh and last probe in its series,Mariner 10 was the first spacecraft to visit Mercury. Theunmanned spacecraft made three flybys of the small, rocky planet between March1974 and March 1975. Thestamp, issued just a few weeks after the spacecraft's final encounter with theplanet, showed Mariner 10 nearing Venus with Mercury in the background. Mariner10 was the first probe to use a "gravitational slingshot," employingVenus' pull to accelerate it towards Mercury. It was also the first mission tovisit two planets. Mariner10 graced a second stamp 16 years later as part of a "Space Exploration"series that featured one design for each planet in the solar system. Each29-cent stamp depicted the planet being visited by a robotic probe (all butPluto that is, which was included in the set but as noted on the stamp was"Not Yet Explored"). UntilMESSENGER launched on Aug. 3, 2004, Mariner 10 was the only probe to be sent toMercury, hence the U.S. Postal Service recycling the mission for another stamp. Ifall proceeds to plan, MESSENGER will become the first spacecraft to enter orbitaround Mercury (as the title of its 2011 stamp proclaims) on March 18, 2011. Toget there, MESSENGER has to date made one flyby of Earth, two flybys of Venus,and three flybys of Mercury. Continue reading at collectSPACE.com to seeall the space stamps released by the United States since 1948. Copyright 2010 collectSPACE.com.All rights reserved.